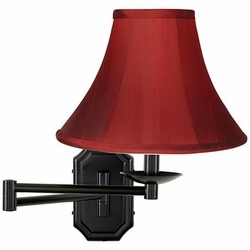 A bold red Dupioni silk shade is the perfect choice for this dark bronze swing arm wall lamp. This swing arm wall lamp looks great by your bedside or next to your favorite seating area. Comes in a beautiful dark bronze finish. Bold color complements the gentle curves of this deep red, Dupioni silk bell shade. Lamp plugs into any wall outlet. • Backplate is 4 1/4" wide, 7" high and extends 25 1/2" from wall. • Shade is 5" across top, 12" across bottom and 8 1/2" high.